I have a few pet peeves when it comes to people and these three are at the top of my list. The grocery shopper that blocks the aisle with their cart, then gives you an annoyed look when you politely say “Excuse me”. The driver that forces you to slam on your brakes because they pull out in front of you when there’s nobody in sight behind you. Usually they end up driving well below the speed limit too. The person that crunches loudly when eating food or chews with their mouth open. Here’s what’s strange. I know it’s not their fault, but noisy eaters bother me the most. Ironically, I don’t mind watching or listening to Haley crunch food or chew with her mouth open. As a matter of fact, I find it amusing. Why am I so tolerant of Haley’s crunching when sometimes I have to leave the room when a human is eating the same way? The truth is, there are very few things that bother me about dogs compared to humans. Yes, it’s not always pleasant when a panting dog gets in your face to greet you with their steamy dog breath or when you reach down to pet your pup only to realize they’ve just rolled in some nasty smelling substance, but I generally find dogs to be much less annoying than people. I wonder if dogs feel the same way. I’m sure they have their people pet peeves, but are they more tolerant of humans than other dogs? Haley prefers the company of people over dogs, but I can always tell when she’s irritated with me. She’ll walk away from me but turn her head enough to give me “the look” or she’ll slowly lie down while letting out a grumble of displeasure when she doesn’t get her way. If I had to guess, these would be Haley’s top three people pet peeves. Haley’s not a fan of having food balanced on her nose then trying to catch it in the air. I think she feels it’s quite demeaning. Loud sneezes from the humans will sometimes send her out of the room. Hearing the phrase, “In a little bit” means maybe later to Haley and I usually get a little doggy back talk in return. Whether it’s loud crunching or loud sneezes, I guess we all have things that irritate us sometimes. Are you more tolerant of pets than people when it comes to peeves? 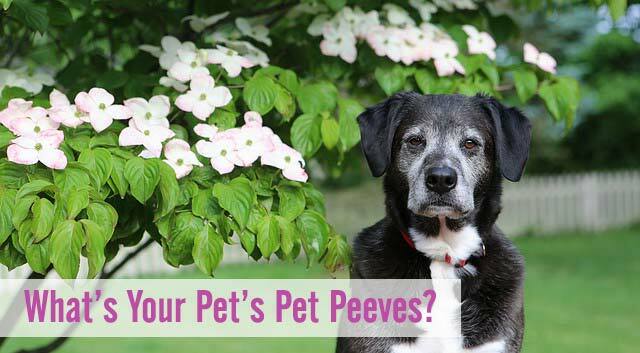 Go ahead, vent your most annoying pet peeves in the comment section and let us know your pet’s pet peeves too! Mia doesn’t like clicking or beeping. Leo doesn’t like it when his ears get handled or when I touch his feet. Sensitive shepherds! Haley agrees with Leo on the feet! It would be interesting to know what causes their associations, like maybe someone tried clicker training with Mia before you got her and it didn’t go well. Wait, or just a minute are our top pet peeves at our house. Just a minute can be like hours if Mom is at the computer! Katie would say it is photos. These days she is pretty much out of the photo shoots, but before she started feeling poorly, she disliked the camera thing. She especially never has liked being asked to do silly things for photos. I bet Katie’s glad you’re so cooperative with the props and photo shoots, Emma. You’re a natural model and the camera loves you! ? Ruby is pretty easy going. She doesn’t like taking her medicine, but still tolerates it. I don’t like when people are super loud especially in public places or feel a need to talk constantly. I also am not a meeting person and get especially annoyed when others in meetings make them take longer because they won’t stopping talking about tiny details that could be solved in emails. OK, I feel better now. Venting is fun sometimes. Oh my gosh, senseless meetings are the worst! I once had a boss that wanted to have team meetings every morning to get a status update. As web programmers, there was very little to talk about on a daily basis. Luckily, he didn’t last too long on the project, lol! Hershey’s pet peeve is small, fluffy, white dogs. Perch hates it when you try to get him off a guest’s shoulder while he’s busy eating their hair. Graham hates to have his toes messed with, especially when he’s asleep. Morph hates when it’s quiet and solves it with soul shattering yowling. Marsha isn’t fond of being left alone with Hershey. My favorite pet peeve is a dog I know from the dog park who’s name is Peeve. Lol, it sounds like a lot of fun at your house! Perch must really keep things interesting but the whole gang together must be entertaining. Now, all you need to do is invite Peeve over for a pup party! ? Purrseidon’s pet peeve is not being allowed to go out an play in the rain and/or puddles. I LOVE Purrseidon’s name and now it all makes sense why the rain and puddles are so attractive, haha! Yes! Sometimes it’s almost like they have an “I was here first.” mentality and they think it’s rude for someone to suggest they move at all. Kilo’s is the mailman… or anyone in uniform really. It drives him nuts! It would be hard being a letter carrier if you’re a dog lover. I would keep trying to win over all those pups by carrying treats with me. When its time for dinner! And I’m not paying any attention so I get “barked” at by my old dog Bruisy! They sure have a way of letting you know when you’re late with their dinner, huh? ? I love hearing our boys crunch on their food, especially with things like carrots or crunchy romaine lettuce. It’s hard to find many faults with dogs. They’re all about love and having fun, lol! ? My pet peeve involves nail clipping. This is not an activity that should be done at one’s desk or on public transit. But apparently, I am the only one that feels that way. Liam the pug really has no peeves. His a joyful guy about almost anything. But Sinead has a long list of grievances, including humans that try to pick her up, humans that walk through her yard, cats that wake her when she’s sleeping, pugs that will not chase her, birds that caw during the day, wind blowing too fast…. I could keep going. I stand with you on this, Jean! I used to share a cubicle at work with a guy that clipped his fingernails while sitting at his desk. I never understood why he did that, but luckily he never clipped his toenails while in the office, lol! Haha, I so agree with you as far as humans are concerned who make noise while eating their food – totally annoying. It also irritates me to see women’s uncared for feet in sandals, you know, long toenails, nail polish that only covers half of the nails, and dry, cracked skin. Those long toenails, yes! They kind of creep me out too. ? Don’t you love the look you get when you try to get away with giving a quick belly rub? Haha! Mr. N does not like being petted over the head or having his head sniffed by other dogs. That’s always where little kids and most adults reach for when petting a dog too. I guess it must be human nature to do that, but I always tell kids to pet Haley on her chest when she’s sitting. I get annoyed at people who dominate conversations and/or who only talk about themselves without ever showing interest in anyone else. My pet rats get peeved when I tell them “Food is not love”. They stare hard at me silently willing me to give them just one more treat. Somehow, I always seem to attract those people that only want to talk about themselves, lol! I can picture your rats looking at you and thinking, “Yes, food is not love but if you love me, you’ll give me one more treat.” It’s hard to resist those looks too! ? Your pet peeves are the same as mine!! So true! I also can’t stand finger/knuckle popping noises, slow drivers in general, and people who don’t pick up after their dogs. As for Haley, she’s just so darned cute chewing her food and she looks so happy you have to love that face! Dante feels Haley’s pain, he also hates to balance treats. And Ziva definitely prefers the company of humans over other dogs. I just realized that I’ve never popped my knuckles or fingers. I don’t even know how to do that, but I hate the noise too. I bet Dante gives you the same look that Haley gives me when putting food on their noses. You can almost see a canine version of an eye roll as they turn their heads away, haha! Jaxson can’t stand my veggie chopper. He leaves the room but makes sure he rolls his eyes at me before he disappears. Lol! Don’t you just love all that personality? ? Dakota’s pet peeve is DEFINITELY when someone sneezes, specifically, when my husband sneezes! Yes, “man sneezes” seem to be the worst, lol! One of Stetson’s pet peeves is when I tell him it’s 430 and he has to wait until 5pm to eat dinner. Haha! If they had it their way, the time would slowly creep up 30 minutes each day until dinner became breakfast, right? Around here, “wait a minute” is usually at least 30 minutes, lol! ? Oh, boy… Rita and I both have quite a few pet peeves…. Let me see if I can narrow it down! One for me that I REALLY hate is when folks carry on loud cell phone conversations in a public toilet. Good grief – what are they thinking??? That’s strange, isn’t it? With all the bathroom noises and toilets flushing, yuk! What’s worse though is having a conversation with someone when you realize they’re actually at home using the bathroom while you’re talking to them. I am definitely more tolerant of my dog and cats habits than humans. My latest pet peeve are people who jog on the sidewalk with their dog and come charging down the street right into Bailey and me while we are trying to walk. I think it’s Bailey’s biggest pet peeve too. Aw, that’s got to be pretty unnerving for Bailey to see those joggers coming so fast towards her. ? I think me and my dogs all HATE when people don’t pick up after their dogs! There’s nothing worse than stepping in someone else’s nasty stuff. My Husky Icy also hates when we go to bed too late. She likes her peace & quiet after a certain hour. I agree, Cathy! It seems like more people are picking up after their dogs, but in some areas of our town, it’s like walking through a canine minefield. Yuk! My pet peeve is people who waste my time. Makes me nuts. Our dogs don’t like sneezes either….lol. Yeah, I’m the same way and should practice being more patient sometimes when dealing with people like that.